The Apple Watch is here. Is it worth the wait? 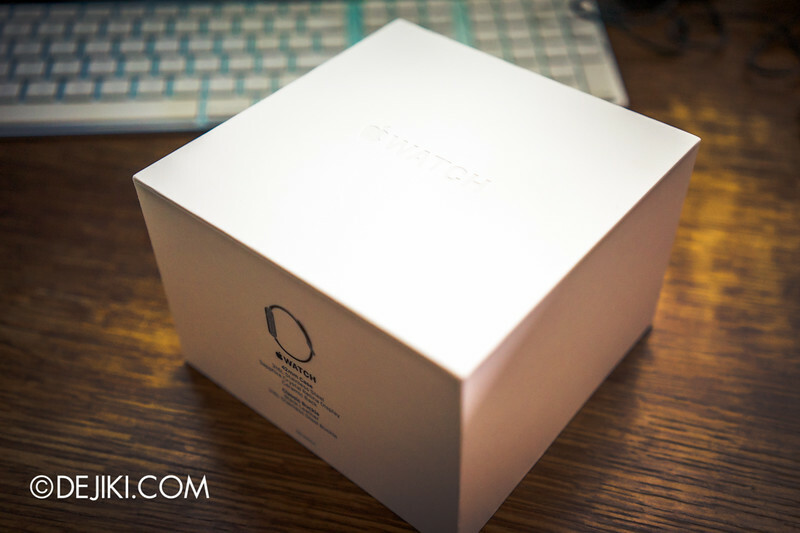 Check it out in this unboxing photo tour! Not sure which Apple Watch to get? We’ve got photos of the Stainless Steel Watch paired with the Milanese Loop, Classic Leather Buckle and Link Bracelet in this entry. See the accessories unboxing here! 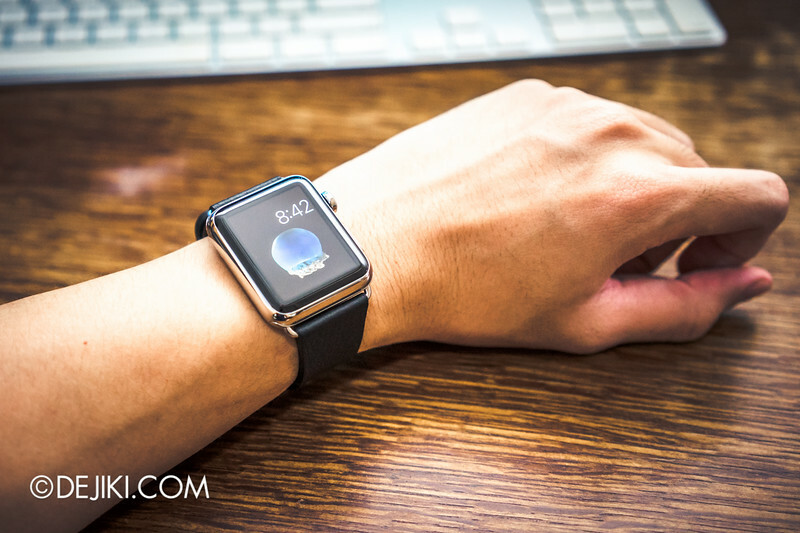 Apple Watch will launch in Singapore on 26 June at the Apple Online Store and select resellers. 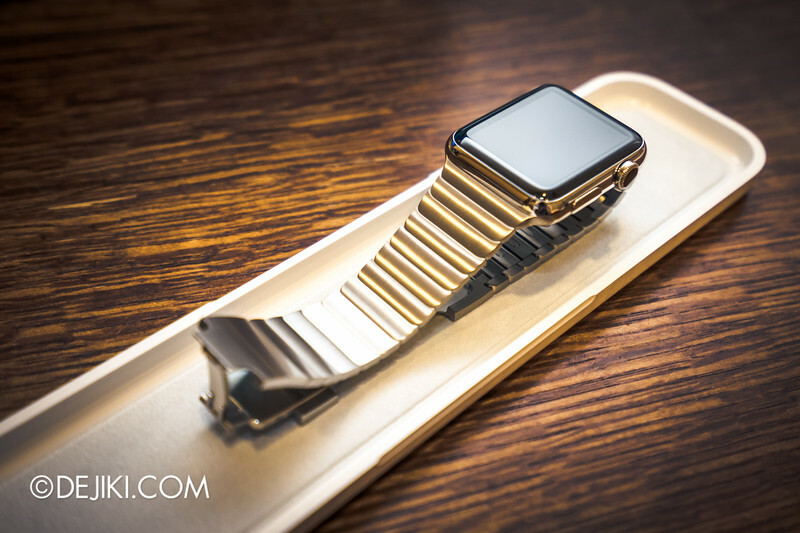 Malmaison by The Hour Glass will be carrying select models, including Apple Watch Edition (18-karat gold models). Well, the Apple Watch has not launched in Singapore yet, but that doesn’t mean that you can’t get it. Within Asia, it’s available for sale in Hong Kong and Japan via Apple’s Online Store. In Japan, several retail stores are also selling Apple Watch. It’s also possible to buy it in Singapore from resellers – a bit of research will guide you to the right places. 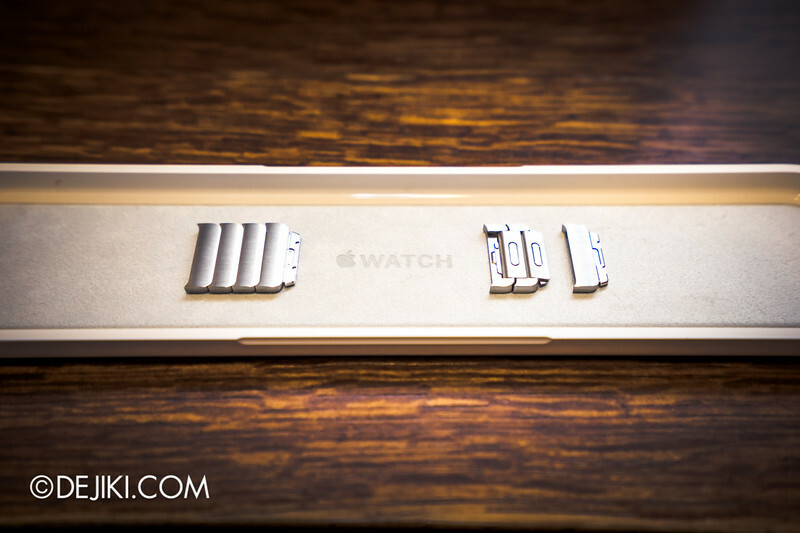 Apple Watch has three collections, each with distinct differences in the materials of the watch case and overall feel. 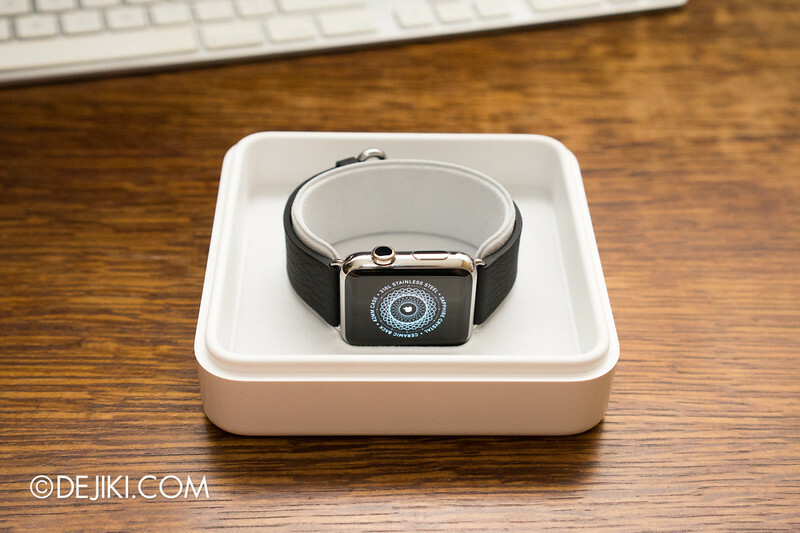 The main Apple Watch (stainless steel) collections is packaged in this square-ish box. 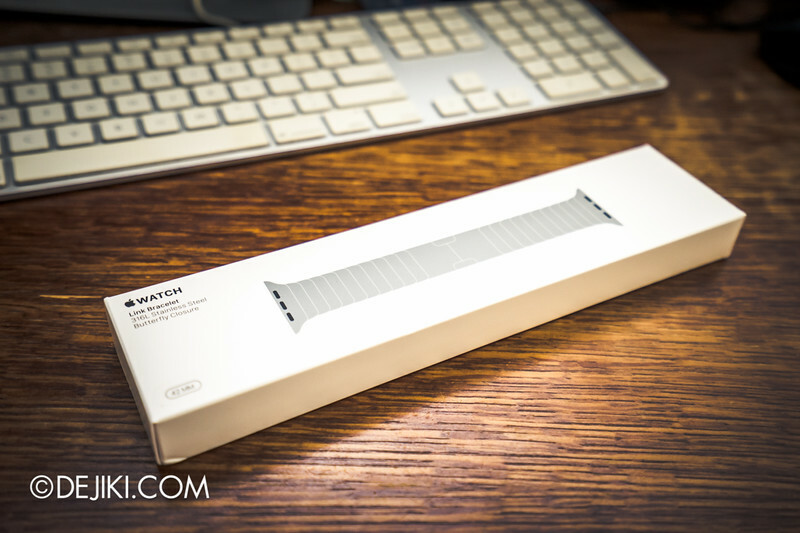 Apple Watch Sport is packaged in a longer, rectangular box. This white box is surprisingly heavy for a watch. 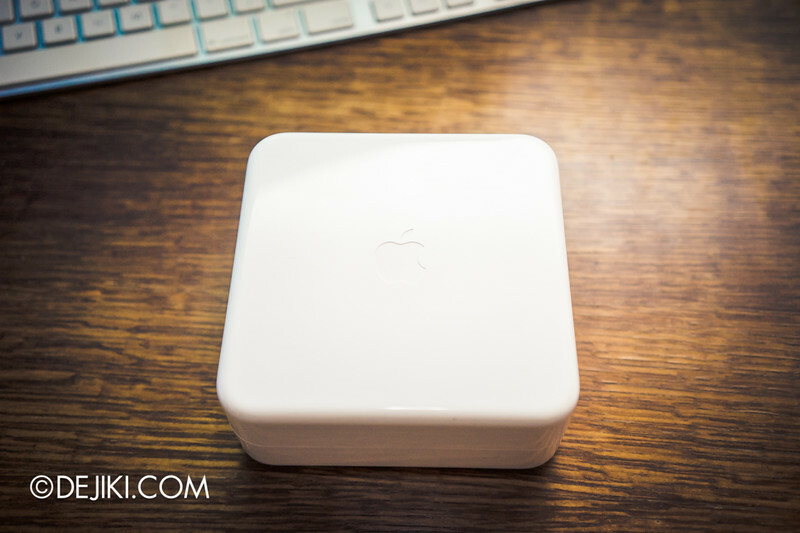 Typical of Apple, it is entirely white and has the product name subtly debossed at the top. 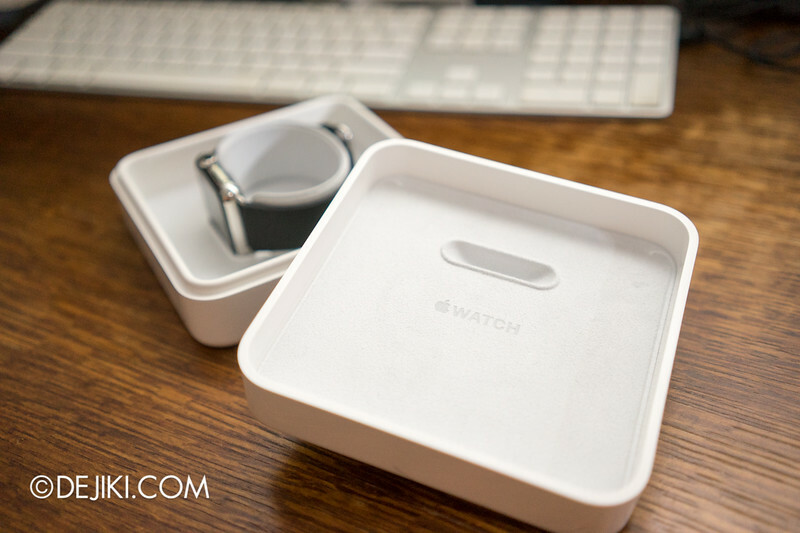 Unlike iPhone and iPad, the watch is safely kept inside another box – a presentation case that’s plastic and white. After lifting it out and peeling away the seal – the watch is finally ready to see the world. 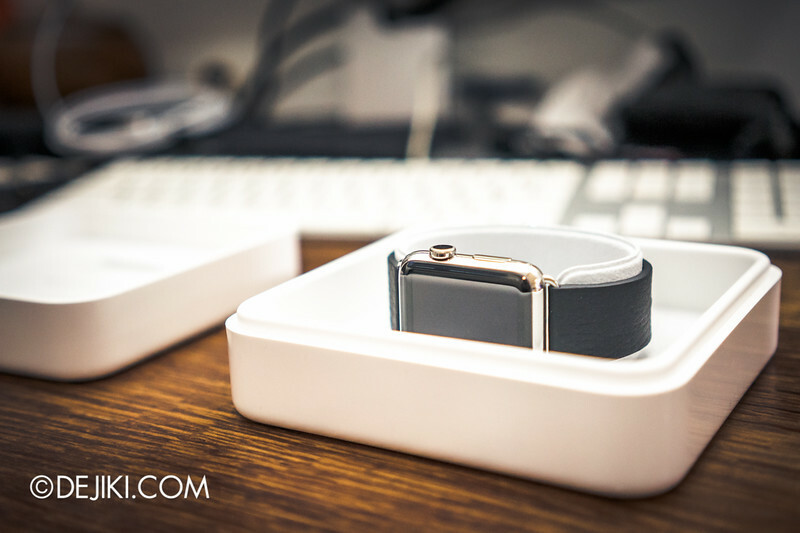 My Apple Watch is the 42mm stainless steel case paired with a Classic Buckle band. This version goes for US$699. It looks like the Apple Watch Edition I initially wanted (thinking it’ll cost S$3-5k). Instead, it is retailing for US$15,000. For that price, I would rather get a Cartier Love bracelet in Platinum spend it on a trip to Florida for the theme parks! 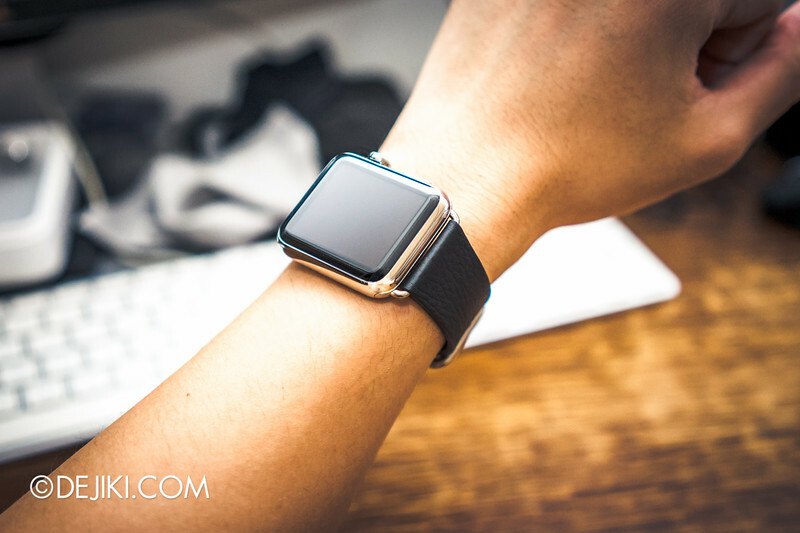 The Watch looks like a luxury fashion product that Apple would design – and that is precisely what it is. Other wearables in the market (Pebble, Razer Nabu, Microsoft Band, Xiaomi Mi Band, Misfit and Fitbit products) cost a lot less and aren’t designed to be fashion accessories. It’s definitely more function than form. But does function matter… for a luxury product? 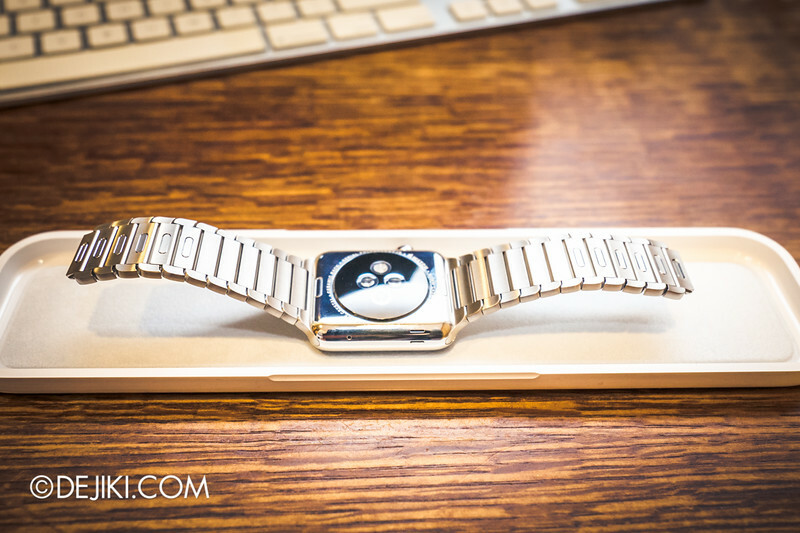 Apple is confident with their design that they even have 18K Gold variations of the Watch. There’s a lot of thought in whole experience of the Watch. The user interface is clean, beautiful and animates very smoothly, like most of Apple’s devices. Even setting it up is memorable: Align the iPhone’s camera viewfinder into the Watch that displays a mesmerizing, swirling ball of Apple’s magical pixels. No Bluetooth pairing codes to deal with. And then, both the iPhone and Watch are paired forever… until they are replaced months/years later. Also in the box: A 2-metre long Magnetic Charging Cable and a 5W USB Power Adapter. 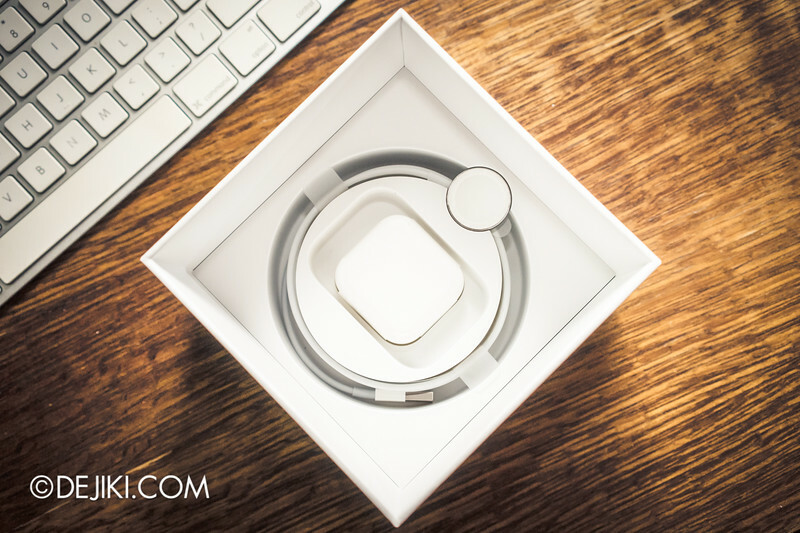 For certain markets, the Watch will be bundled with a new power adapter with a compact folding design. Back to the watch – You’ve seen lots of beautiful renders on Apple’s website and advertisements. How does it actually look like when worn? Looks rather cool, I’d say – as if I’m wearing some rectangular black gem. It’s comfortable. The Retina display, which is a flexible OLED, is very vivid and sharp. The user interface is also designed well to hide the edge of the display, making the screen blend seamlessly with the curved edge of the sapphire glass as much as it could. Only with strong light from certain angles (such as the flash used to take these photos) could expose the display’s edges. The leather band of the classic buckle feels.. oddly synthetic. It is from the ECCO tannery in the Netherlands, according to Apple’s marketing materials. The leather has a subtle grain, but it feels like it was molded – the grain is very consistent, as if it was corrected. Its inner side shares the textured finish as the outside – but with smaller grain. The stitches on the inside look pressed, and the band’s edges lack burnish. Perhaps this clean, machined look was an effort for minimalist simplicity. Right out of the box, the leather feels a little ‘paper-like’ and rather stiff, but it should soften over time. 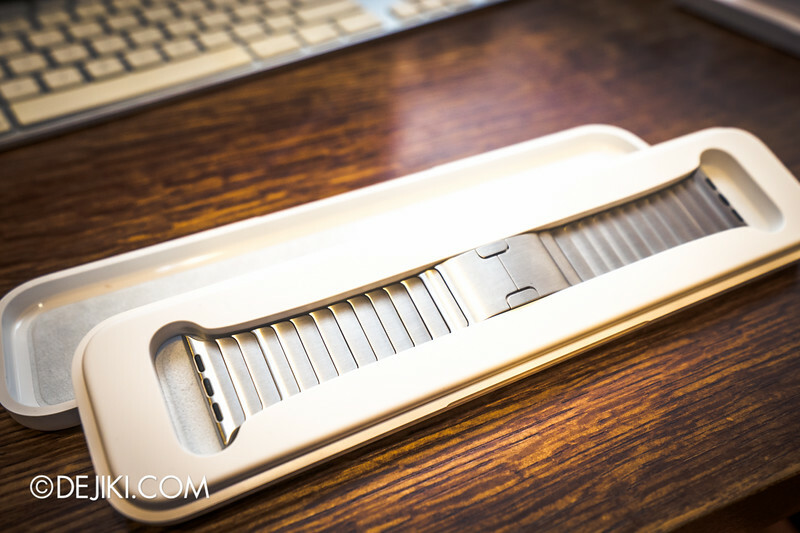 Apple Watch bands can be quickly and easily detached by pressing the buttons at the back. And here you can see the LEDs and sensors for heart rate, which are grouped in that black ceramic disc. There’s also a sensor here that detects wrist contact – the Watch automatically ‘locks’ when taken off. So what does the Apple Watch do? 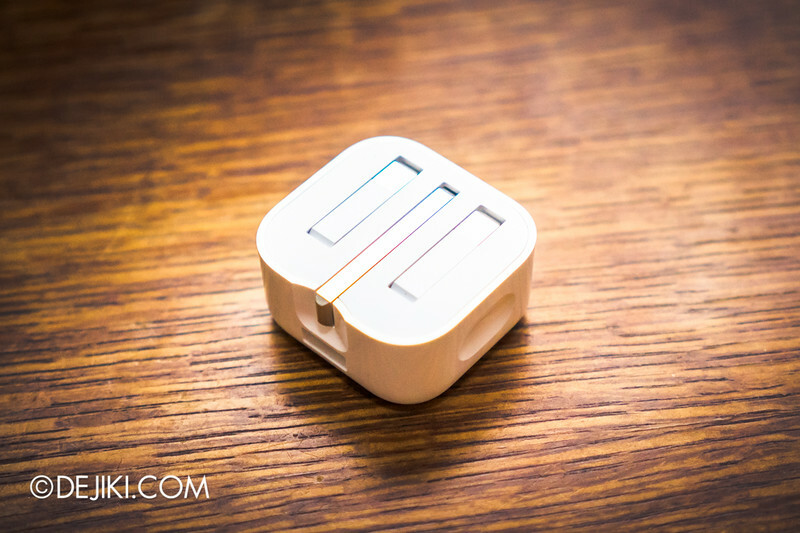 Apart from timekeeping via customisable watch faces, it functions as a pocket notification mirror for the iPhone. You can choose to mirror every notification that shows up on the iPhone, or be more selective. The watch would chime (you can silent it though) with a few light taps from the Taptic Engine. A wrist raise would then show the notification. This is a big difference for me, because it is much more subtle to tap something on my wrist than to take the iPhone out of my pocket. And there are times where I can’t bring my phone out (whether it’s in a meeting, a photoshoot where my hands are already busy, or the phone’s left on my desk) – this totally alleviated that. When I get a notification, I raise my wrist to view it. Is it important? If yes, I can take out my iPhone and it’ll jump to the right app for further action. If not, I lower the watch and the screen turns off. So perhaps I could finally start ditching the habit of holding my iPhone as I walk. The haptic feedback of taps – what Apple calls Taptic Engine – is not like the vibration from iPhone and other smartwatches (i.e. Pebble). It felt like the Watch’s tiny heart came alive and started beating. Thump thump. Messages (iMessage/SMS) and emails can be easily read and attended to via quick replies, animated emoji and dictated messages. But any other apps, such as Facebook Messenger, WhatsApp, Telegram etc would only show notifications. Until more 3rd-party developers get started on better Watch Apps, the Apple Watch is only useful for communication within Apple’s walled garden. Currently, the Watch App Store is filled with not-so-useful and awkwardly designed apps. 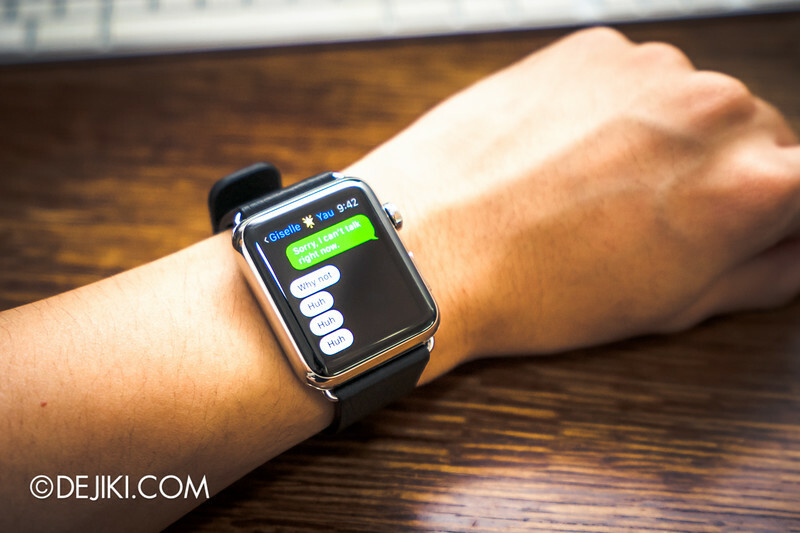 We don’t need to scroll through Instagram feeds with the digital crown on the Apple Watch. It’s also awkward to play games on a device this small. Battery life is better than expected. It still has about 50% of juice left after 12 hours of ‘normal’ use – browsing notifications, loading bus wait times, reading short emails, etc. The Watch’s display is always off unless activated via a tap or a raise of the wrist. Most of the time it’ll look like a bracelet with a shiny black gem. 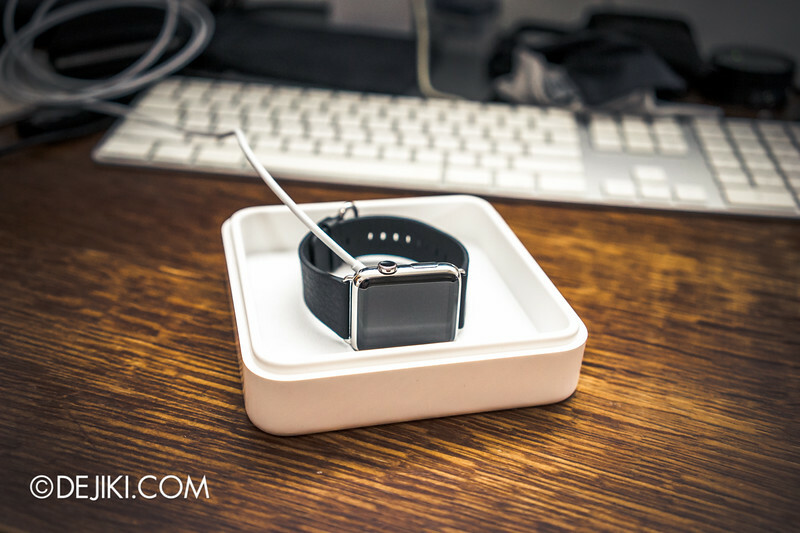 The plastic case is lined with felt and could be used as a place to rest the Watch to charge. 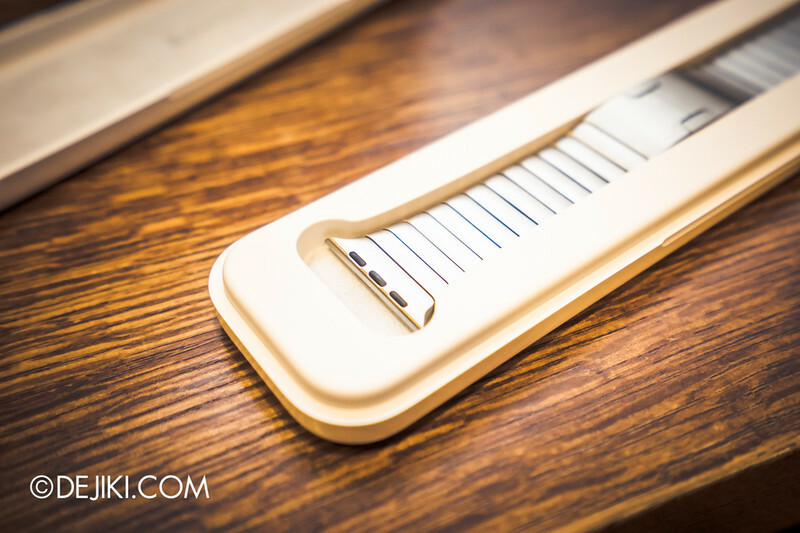 Apple should sell a Magnetic Charging Case with the Charging disk embedded, much like the ones for the Apple Watch Edition (18K Gold version) or in-store try-on tables. Apple Watch Accessories will be featured in this section. The most beautifully complex band just so happens to be the most expensive. It looks like an ordinary steel bracelet, but depending on your taste and knowledge on watches (especially how much notable brands charge for their Steel bracelets), this band could be a bargain. 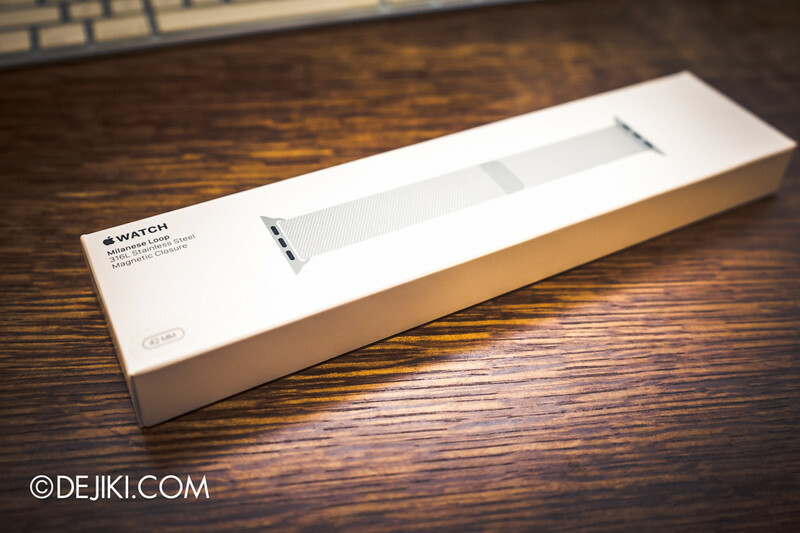 Let’s step back a bit and look at how Apple packages its Watch Bands. 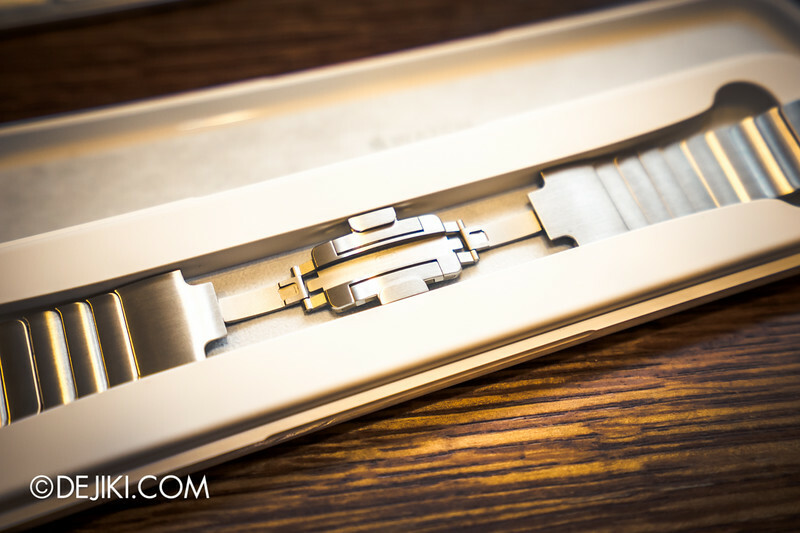 It’s far more luxurious than packaging for competitors’ entire watch kits. Each link has a subtle brushed finish, but is still rather reflective. It’s lovely how each link reflects light (without being too dazzling), especially outdoors. The Link Bracelet is machined out of solid stainless steel, unlike most cheap steel bracelets – which are ‘folded’ and thus feel hollow. Overall, the bracelet is very thin and while it is the heaviest bracelet available at retail stores, it does not add too much weight to the watch. Having a butterfly closure, the deployant buckle is perfectly symmetric. 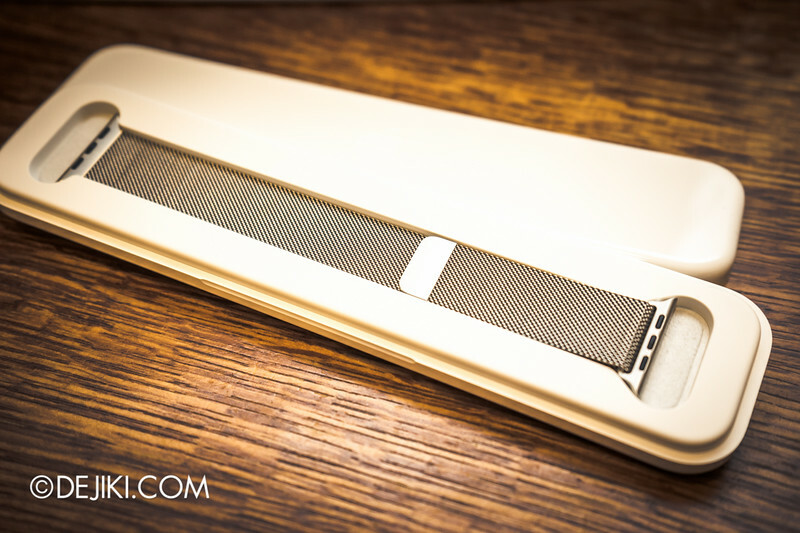 It’s also VERY thin – something that’s rare in the world of watches. 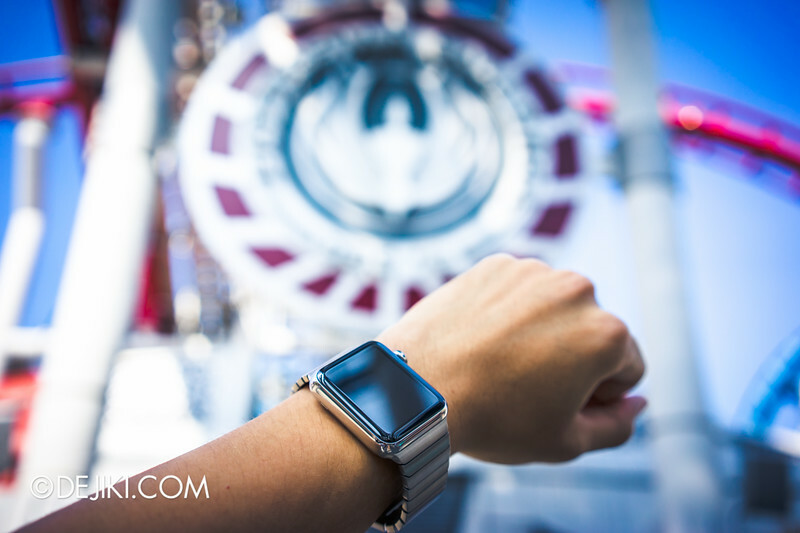 Despite its sleek form, it keeps the watch locked well – my countless rides on roller coasters will attest to that. The inside of the Link Bracelet is finished as beautifully as the outside. Just so pretty to look at. Despite its “built like a tank” look, the links are not entirely rigid. There is a bit of lateral flex. The easy adjustable link design is the most overlooked feature. Tools are not necessary to add or remove links. Just a gentle push of the small button inside, and a link is released individually. It’s rather elegant (and barely exposes the complex parts inside every link), which is why this band costs far more than the rest. It is obviously much harder to design and manufacture. This is currently my favourite bracelet. 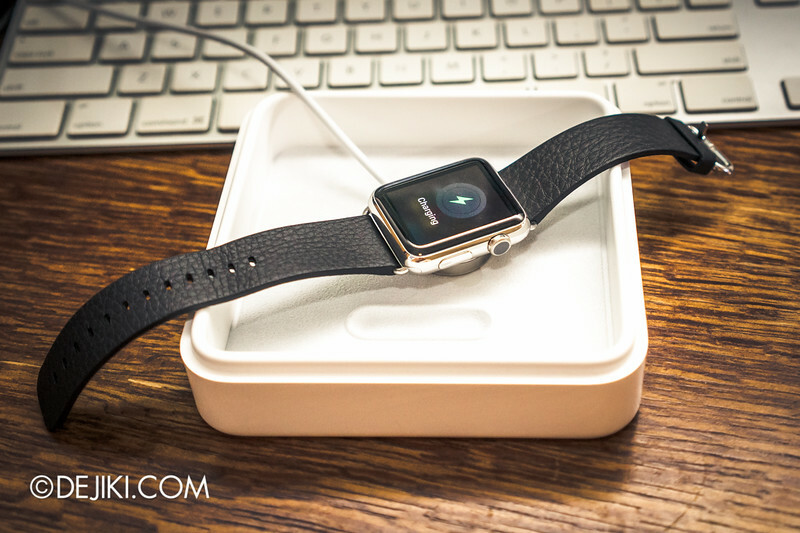 It’s not as comfortable as the Milanese Loop, but it lends a substantial look to the Watch. I actually wear this for running because it feels the most secure. Milanese meshes are not new in the worlds of timepieces and jewellery, but Apple’s band has a unique twist – it’s a magnetic loop with no clasps. This is one of the two easily adjustable options (the other being Leather Loop, which works pretty much the same way). Being a mesh, it’s very comfortable – tiny holes make it breathable, and the band is silky and very flexible. The best feature is still how its very adjustable. 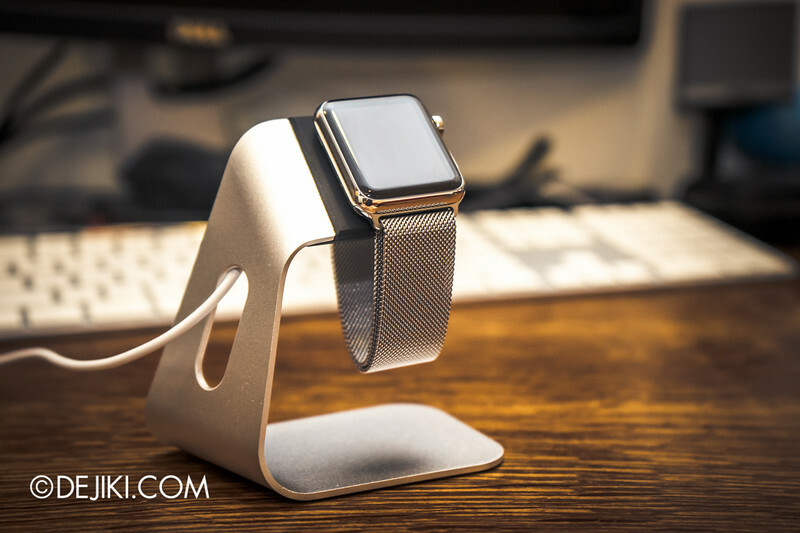 A watch stand is an easy way to keep your watch charged at night. This Watch Stand by Spigen is one of the cheaper options available. 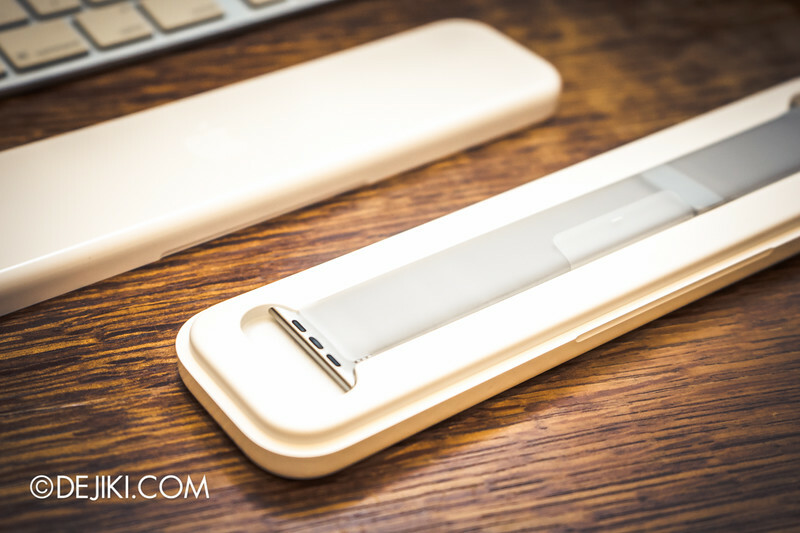 The Magnetic Charging Cable fits into the unibody aluminum stand, keeping the watch afloat. 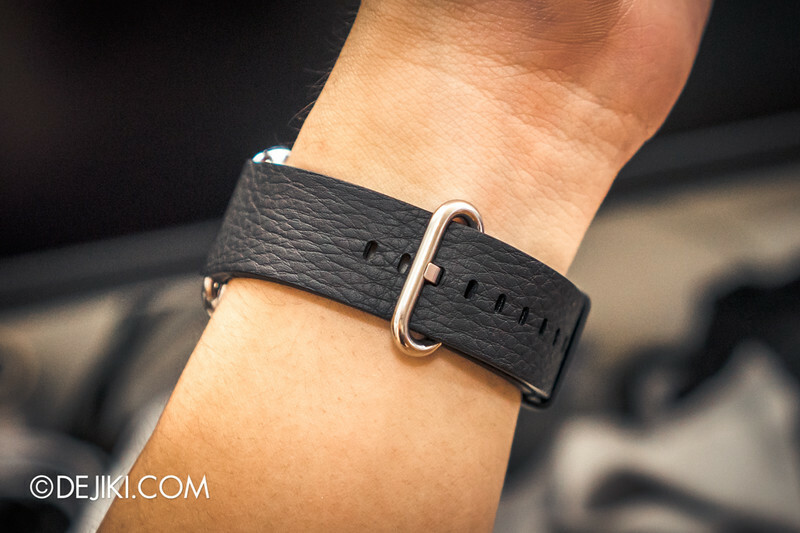 Useful for the Milanese loop, as the mesh band would stick to itself due to magnetism. 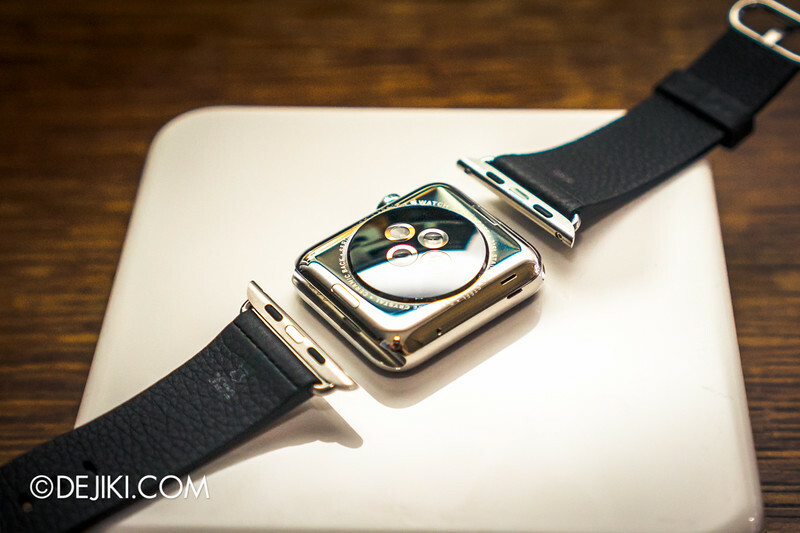 Watch cases for Apple Watch might seem pointless, because they completely break the aesthetics. However, they might be useful for activities that may damage the watch, such as intense exercises. 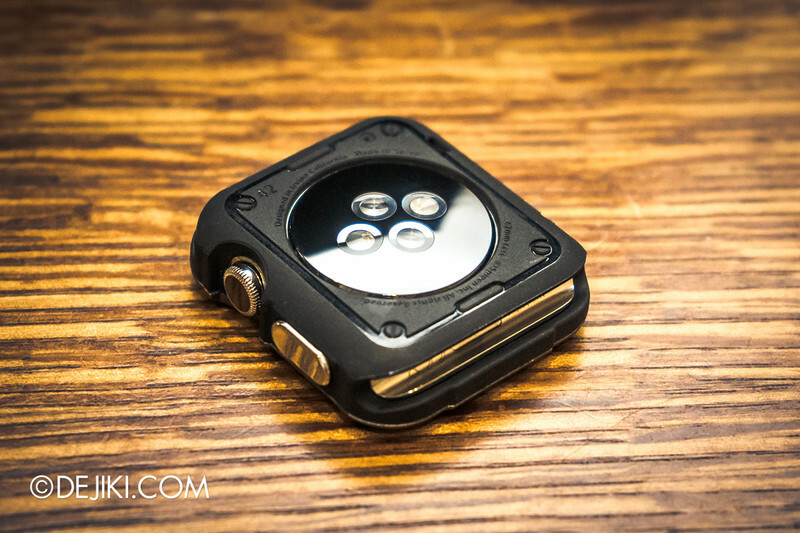 The Spigen Tough Armor gives the watch a ‘G-Shock’ look, which isn’t entirely that bad. 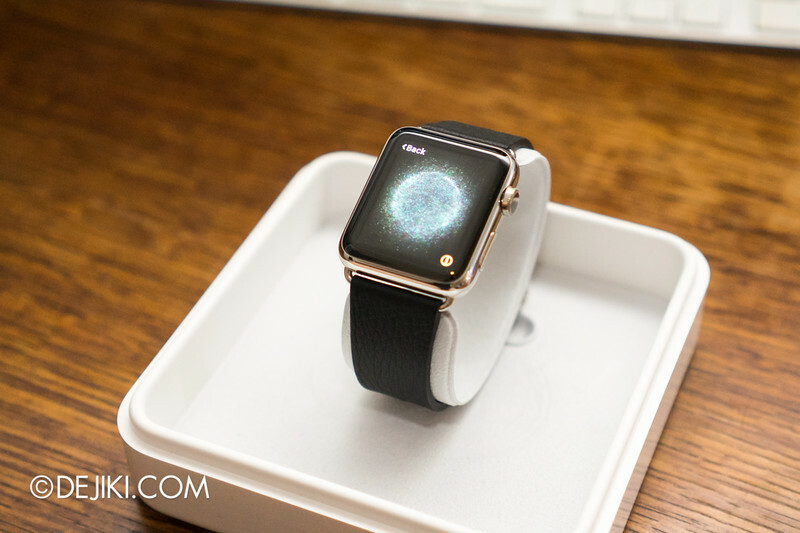 It comes with a semi-hard film that acts as a screen protector for the watch (no bubbles too). 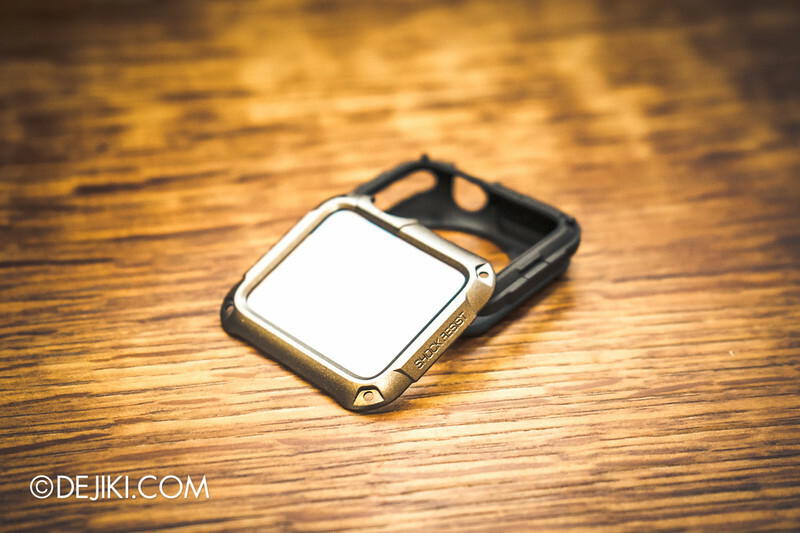 This case protects almost all parts of the watch, leaving the Digital Crown exposed for better access. Even the strap release buttons work. A lot of people have asked me, since the Apple Watch announcement(s), if the Watch is useful and whether they should buy it. I think it’s a wrong question, because this is not a ‘need’ thing – we’ve lived our lives without the Apple Watch. 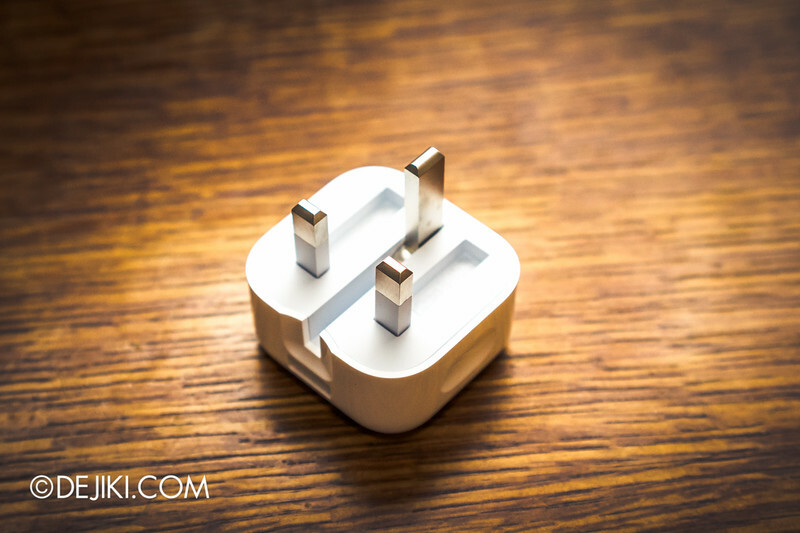 It is an accessory – and perhaps Apple’s most beautiful product. This is a luxury lifestyle product. You have to WANT it. A desire like upgrading to the latest iPhone when your current one still works – just because “it is new, the old one looks fat and screen is too small”. Yes, you know who you are. If you don’t have even a faintest feeling of that for the Watch, then it is probably not for you. You should’ve seen all the feels on Reddit when the Watch was starting to be delivered a week ago. Is this a game-changer? Maybe. 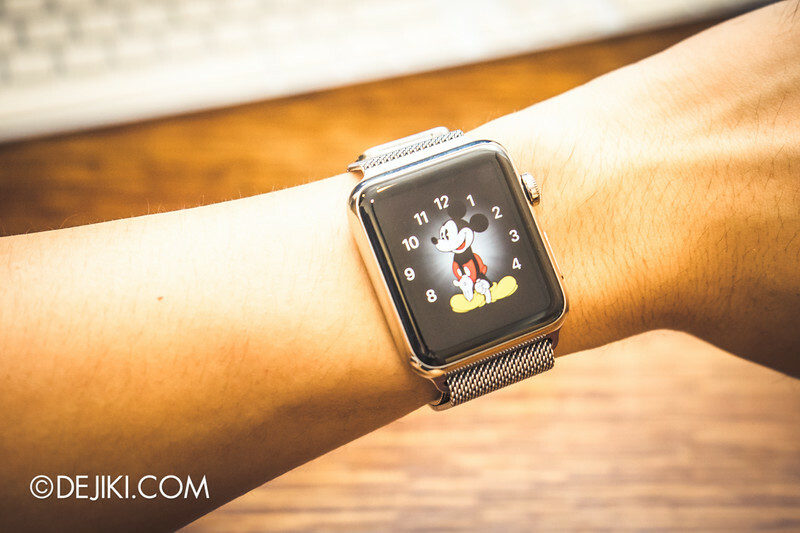 Will every iPhone user be wearing an Apple Watch years down the road? Apple Watch will launch in Singapore on 26 June 2015. I happen to fall into the group of people who want this bad. Anyway, I would like to ask about how you got the watch and for how much. I’m looking at Carousell and it’s pretty steep there, like almost double the price. I’m going to Japan this June and I saw that you mentioned it being available in some retail shops in Japan. Does it mean I can walk in and get it? I have been looking online for more information on this, but to no avail. Thank you for taking time to read this. You may reply to this query via email. (for more privacy). Depending on which model you are looking for, there are listed at a reasonable mark-up ($100-200 above retail), which isn’t that bad considering some sellers were asking $1500+ for Apple Watch Sport and close to $2000 for the Stainless Steel models. In Japan, the Watch is available at the Isetan Shinjuku, Dover Street Market Ginza, as well as BIC Camera and Yodobashi. However, they can be sold out quite often. Hi Dejiki where did you purchase the apple watch?